We, the mortals of the world, decided to finally fight against the gods of Mt. Olympus. * And, oddly enough, we won the battle. But, during the war, everything on Mt. Olympus was destroyed -- the buildings, the plant life, and even much of the land that the city was sitting on. If we are now going to take a place on Olympus (and we are), then we need to rebuild everything. We need to add more land to what is already there. We need to build buildings for all of our people. And we need food and other plant life to help sustain us. 1. Add land to the map as you need it, but be cautious about blocking the various ways to get up to Olympus from the surrounding mountains. 2. Even though we are now living in the clouds, we want to keep our "feet on the ground," so the first floor of all buildings must be built on grass (take note of the pic of the storage room below to see that in action). An advance team led by myself has already begun work on the project. Here is the current warehouse. The building is two stories, with a balcony on the second floor so you can enjoy the magnificent views we now have from on high. On the first floor is the storage room (note the grass floor). You may add chests to the storage area as you need them. On the second floor is a sleeping area and some starter kits. We also have started a garden with some wheat. One problem we've run into is that at this altitude, the water tends to turn to ice. So please remember to occasionally go over to the gardens and break the ice to make sure that the crops are getting the water they need. We have lots of natural resources around our mountains, so we should be able to find everything we need close by. There are also lots of animals nearby -- including horses. I have already built a small house on Olympus (with a grass floor) and I urge the rest of you to do the same. And now here is the challenge for the next bold adventurer. 1. Build your own home. It can be in any style or color you want. 2. Add one thing to the garden. We only have wheat and we will soon tire of bread. 3. Build a "Great Hall" so that we can hold meetings there. Enjoy your new place in the clouds, but don't forget that we are mortal. We must remain humble. *This is not meant to offend anyone's religion or to imply that there are "gods" other than the one true God. This is just taking Mythology and building a story around it. This is fantastic, Lydia! You have a great imagination! I am so looking forward to doing this one!!! Thank you so much! I need to get busy and make another one, too. This is just too much fun! I hope your fear of heights doesn't give you vertigo on this one. We're pretty high up there. I'm doing better with that, in the game, at least, and with this one, there's ground underneath. When Carrie and I were doing the Skyblock and End of Skyblock maps (which have nothing but space and the voide underneath the tiny block), I was pretty tense sometimes. I just have to take a break now and again, and remember that it's a GAME! Lydia--I've had a really nice time playing this map. Thank you so much for thinking it up! I kept this one very simple. I put it right by one of the exits down, and protected that exit with a little fence and a gate, since zombies and creepers kept coming up there at first (as well as spawning on the pad itself). I guess I'm now officially the gatekeeper over there! I did go out one direction (SW) to try to find a village. I figured I'd try that one way, and do some hunting at the same time, since food was in quite short supply, to be sure. I went out nearly 1000 blocks, and found one straight-down hole in the ground to explore (with not much to show for it), and a large ravine which netted some quick coal, iron, gold, redstone, and 14 diamonds! I barely scratched the surface of the ravine (just stayed in a small area near the start of it), and also found a mineshaft down there! 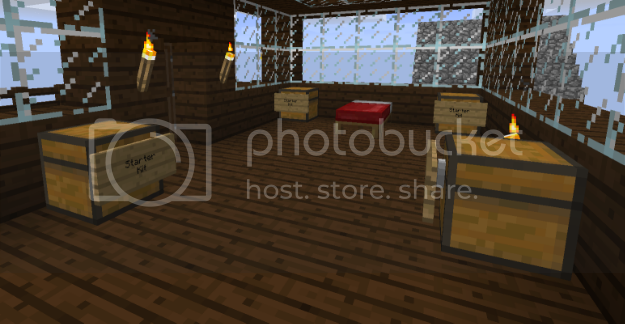 The coords for the ravine and mineshaft are on the .rtf attachment in case anyone else wants to go there. I found horses on my little trek, though! I did NOT find a village, and I didn't find a jungle, either. I DID, however, find two pumpkin patches, so I raided those and took them back to Olympus and planted them. 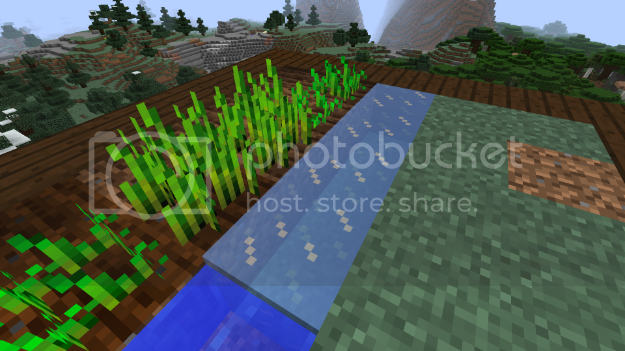 I also moved the wheat over by one square and planted sugar cane right next to the first water trough that was already there. My next challenges include getting the sugar crafted and set aside for pumpkin pies. While I was down in the straight-down hole in the ground, I DID find a large patch of Diorite and a decent one of Granite, so I built the Great Hall from those, glass, and dark oak (stairs and chairs). I think I should have made a few more lines of dirt and built it at least two more spaces away from the warehouse, but...it is what it is. The bottom floor contains seating for playing cards and such, and getting together (I wish we could actually do that--sit in the chairs, etc. 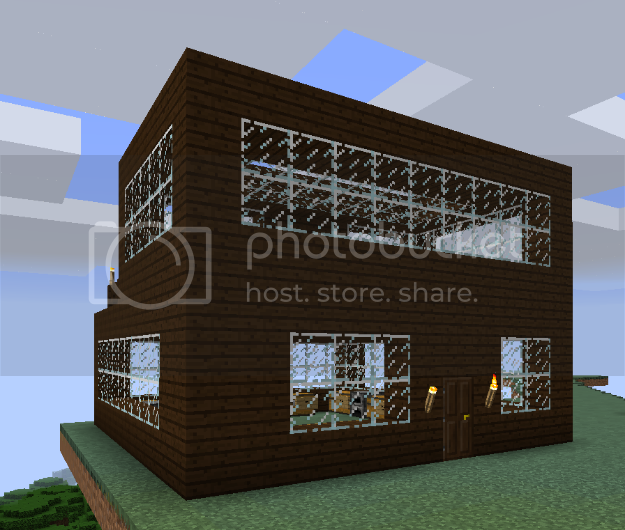 ), and the top floor contains SPACEHOLDERS for an enchantment table and bookshelves. I just placed oak planks in there, to make sure it all would fit OK. Right behind the corners of the shelves, up next to the front window, there are two small chests for holding lapis lazuli and any extra enchanted items anyone might want to place there for future use, or for whatever. Unfortunately, one thing I did NOT find in the ravine (yet) was lapis! That's fairly unusual. While I was doing all of the above, I also planted two dark oak trees near the warehouse, and harvested them several times--replanting each time. Over by my house, I planted a single spruce tree with the sapling I picked up down below. Then I harvest that and replanted, and put a couple of saplings in the warehouse. Here are three aerial views of Olympus as it looks at the moment. Here's the second set of challenges (with the rules stated at the top, just to help us remember). 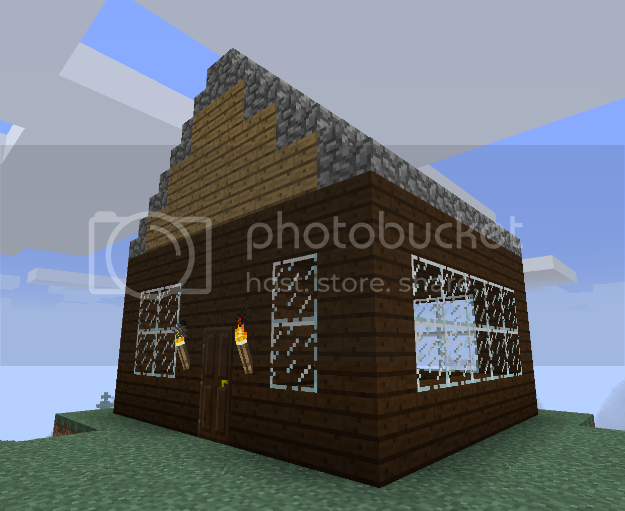 (1) Build your own home if you haven't already done so. It can be in any style or color you want. (2) Down on the mainland there are a couple of swampland biomes near Olympus. Spend some time at least trying to find some slime, so you can make a few leads (half a dozen would be good, if you can). There is PLENTY of string in the Mob Droppings chest in the warehouse. Put the leads into the Misc chest. (3) Add some more land back to Olympus, then set up a big enough animal pen area (with a watering trough and some hay), for two of each animal (cows, sheep, chickens, pigs, and rabbits). You don't have to get the animals. They can be gathered later. Just build their home. (5) There are 14 diamonds in the warehouse SHINY chest. Make a diamond pick and find (or create) some obsidian and mine enough for an enchantment table and a nether portal. Then create an enchantment table that should replace the placeholder for it in the second story of the Great Hall. Put the nether portal obsidian in the Misc chest in the warehouse. 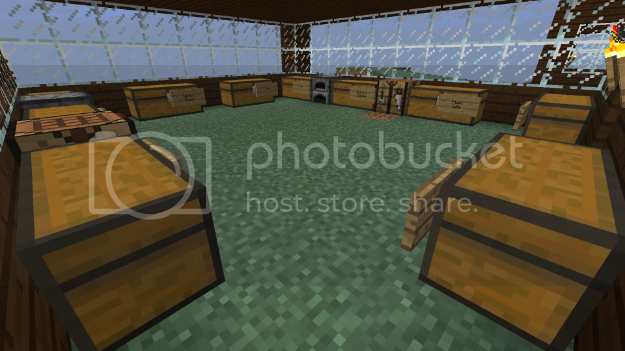 Don't worry about the bookshelves for the enchantment table. Those will come later. Here is the .rtf version of the rules & challenges, for your printing convenience. Here is my .rtf version of coordinates for the map, as I finished playing tonight. 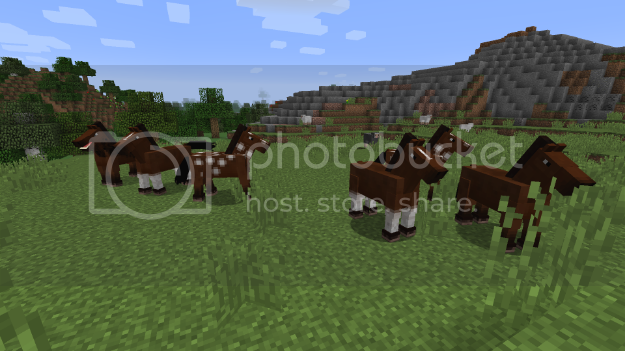 They include coords for the ravine, mineshaft, and horses, as well as everything up on Olympus itself. Oh, Linda, you did a super job with this! The Great Hall looks... Great!! I love how you added so many things to make it look homey as well -- to remind us that we are mortal. Your fence around the area where we can go up and down is a good idea. Maybe we should do that for all of them. I know it's hard to work up there since you have to keep going down below to get supplies, but you did a wonderful job! And as I'm sure you saw, you can't beat the views. Absolutely! The views are tremendous!!! It's not any harder to just go down the mountain to get supplies than in any other map, really. I was trying to think how to use jack-o-lanterns to light up the ground above. They have to be attached to something BELOW them, though. It could be done, but it would be tedious, because we'd have to make the holes above, then go down beneath, then go up block towers to just underneath the holes, then go through, set the lanterns, then go back down. Plus then the block towers would need to be taken down. Lots of time-consuming trouble. In creative, it would be fairly easy to set some quick "hooks" below the holes, or even create a waffle pattern underneath, at the correct distances, that could then be continued out when the land is increased above, so that lanterns can be set in as a matter of course. Still...a lot of work, and torches are much faster and easier--if not as asthetically pleasing. If only we had some glowstone. I just corrected my word, above. I knew when I typed it that it didn't seem right. When I looked at it again, I knew that "ascetically" meant "purely," as in pleasing to someone who is pure....not quite what I meant! I should have used "asthetically," or pleasing to the eye. It was a brain dead moment.